Working women must try and find a way to stand out and get ahead in their workplace, because in present time, the corporate world has become more competitive than ever. Definitely knowledge, ability and skill are quintessential to shine in the office, but so is a pleasing, presentable image. You have to be a complete package to be able to outdo others. Dressing for work in a stylish manner also portrays your professionalism. Dressing up for the office does not mean that you have to leave your personal feminine style behind, and be completely androgynous. You have to be little creative, find out your personal style which syncs with the office wear. Also you might need some guidance for experts. Mensitaly is quite popular for their collection of formal wear and suits. They also have formal wear for ladies that comprises of suits, skirts, shoes, shirts and everything else that a working women might need. Women are luckier than men when it comes to the range of colors they can wear in their offices. You can wear black, blue, grey, pastel shades of pink, yellow, teal, green, blue and the range is actually just endless. For special functions like meetings you could for a women's suit. A royal blue suit is going to be a good choice, especially if you are of a fairer complexion. Accordingly you can accessorise this suit of yours with understated jewelry. Remember that while dressing for office, your aim is to be fuss free, understated, classy and sophisticated. Therefore do not select bright colors, or heavy dazzling jewelry. Stick to minimal accessories like small drop ear rings, or an ear stud top, just a simple light bracelet, or a very light chain with a delicate pendant. 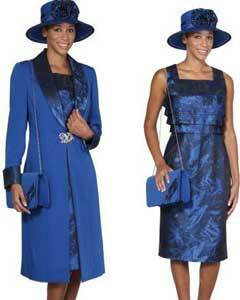 With royal blue suit women's, ideally; silver jewelry is going to be the best. Another important aspect that you will have to keep in mind while accessorising your office suit or dress is the shoes. The heel of the shoes should be moderate, neither high nor flat. When it comes to the makeup, it as well has to be minimal. The shades of the blush should be pastel pink, beige and the lipstick should be similar. Opt out of the eye make up while attending the office. All you should use is the mascara to brighten and open up the eyes. Try to be observant around you especially with your female boss, look how she wear her women's suits, in this way you have an idea on what and how to wear women's business suits in the office. There are a lot of women's suits online; there is a certain level of quality that you can expect when you are shop online and a lot of option to choose from. If you choose for a classic royal blue blazerwomens then it shows that you have money to spend nice and quality things. It also proves that you have a fine taste when it comes to clothes. Make sure not to over dress. Wearing basic black or blue suits with white shirts is very eighties. Too many accessories is another tip off to date you. People making the corporate decisions want a person in touch with today, fashion speaking and corporately speaking.